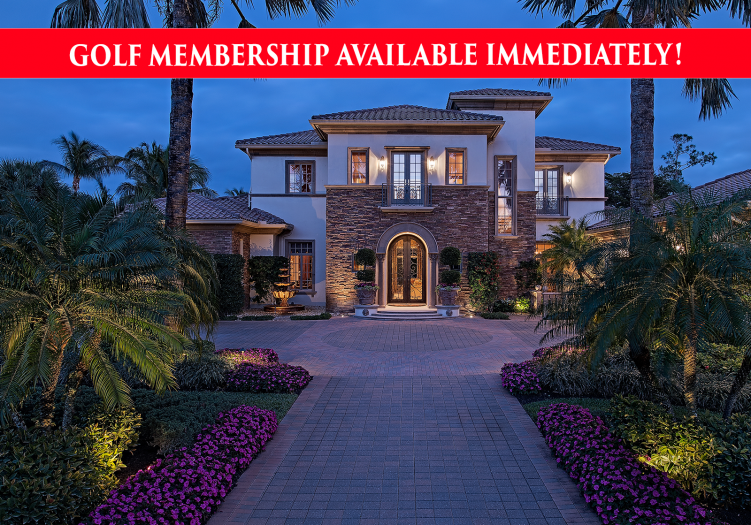 NO WAITLIST TO JOIN MEDITERRA AS A FULL GOLF MEMBER WITH THE PURCHASE OF THIS HOME! 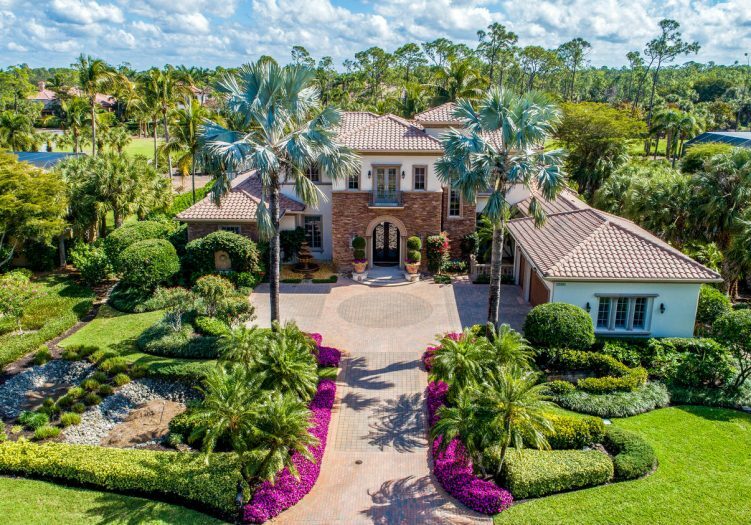 The impressive grand foyer entry sets the tone for elegance and luxury in this lavish two story 4 bedroom plus den, 4 full and 1 half bath estate complete with sweeping golf course views. This home features grand architecture and is accentuated by refined details throughout including captivating and intricate wood ceiling details punctuating volume ceilings, extensive windows, majestic columns, Juliet balconies, full wet bar and wine cellar, private elevator and rich marble and wood flooring throughout the main living areas. 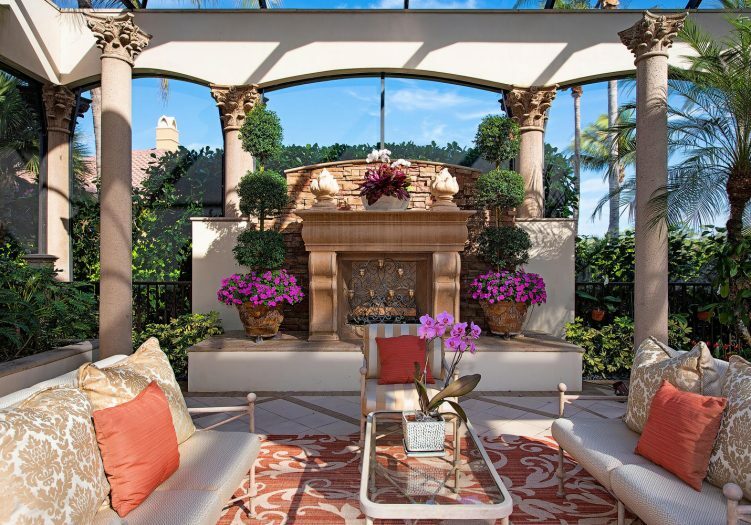 The gas fireplace with an intricate mantel creates a focal point in the formal living room with a wall of French doors, allowing the tropical outdoor views to flood the space. Serve family and guests special occasion meals in the tastefully decorated formal dining room with selections from the wet bar or climate-controlled wine cellar. Top of the line built in appliances, an abundance of raised panel wood cabinetry, granite on the countertops, breakfast bar and on the large center island are found in the gourmet kitchen, overlooking the informal dining area and family room. Wood beam ceiling details and extensive windows and French doors surround the comfortable family room opening to the screened loggia gathering area, perfect for entertaining guests both inside and out. Retreat to the master suite with a seating area in front of large picture windows and direct outdoor access. Rich burled wood accents flow through the spa inspired master bathroom, featuring granite topped his & hers vanities, custom mirrors, a large soaking tub and large walk in shower. Rich wood built-ins, display shelves and storage cabinetry in the den are punctuated by the rich wood flooring, creating a warm, intimate home office space. Ascend the grand spiral staircase to the second story loft gathering area with private guest suites and multiple balconies overlooking both sides of the home. 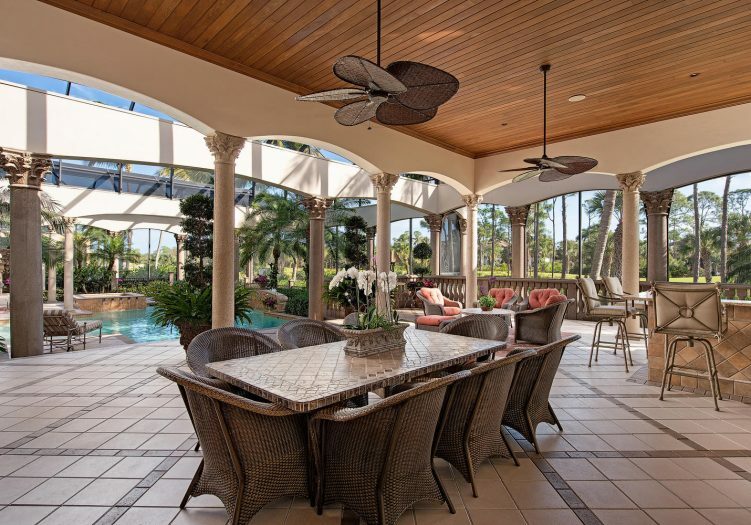 Multi-tiered outdoor living spaces surround stunning pool and spa complete with an exceptional summer kitchen, cozy fireplace and multiple outdoor seating and dining areas, highlighted by tropical golf course views.